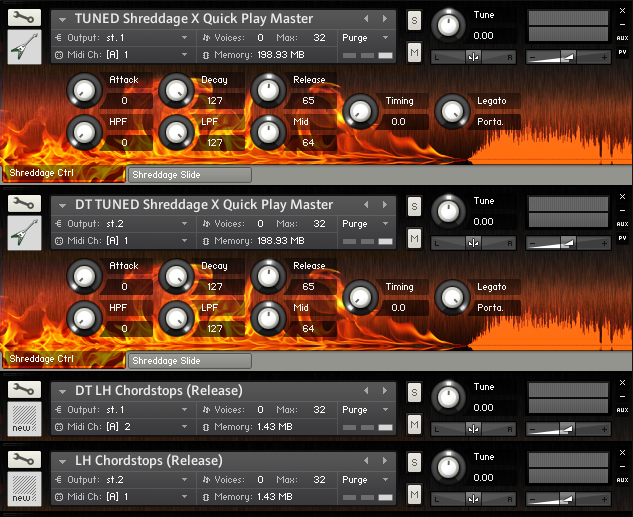 Shreddage: Electric Rhythm Guitar by Impact Soundworks is Soundware (e.g. samples or presets that load into other products). Shreddage: Electric Rhythm Guitar is a sample library built to create the most realistic rock & metal rhythm riffs possible. From classic arena rock to death metal, punk, alternative and everything in between, the versatile clean tone of Shreddage can be amped and processed to fit any track. The library features up to 8x round robins per note, up and down strokes, multiple layers of palm mutes, powerchords, tremolo, vibrato, pinch squeals, harmonics, neck slides, pick scrapes, fret squeaks, release noises and real legato transitions between notes. These articulations are mapped to be as intuitive as possible, requiring a minimum of manual-reading to get an excellent sound. Also included is a free authorized copy of ReValver HPse, an amp sim by Peavey customized for Shreddage. This virtual amp, which runs on both Mac and PC, has a selection of ready-made presets to help get even a guitar tone novice get started. HPse also entitles Shreddage users to discounted upgrade paths to full versions of ReValver such as ReValver HP and MKIII.V. Available via direct download in SFZ and Kontakt formats. i am using SFZ version and Sforzando. but i can't hear sound when i press [3 BLACK keyswitch]. not left side of grey keyswitch, it's middle of BLACK keyswitch. please check the picture and it's 5page of manual.